”My heart skipped a beat” may be a lyric in a love song, but an irregular heartbeat, heart palpitations or a fluttering sensation in the chest can be experienced from time to time. While not generally a serious concern, an irregular heartbeat could be a sign of something more serious. 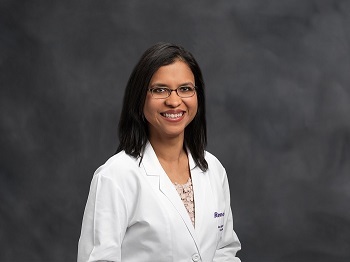 Dr. Anu Agarwal of the Renown Institute for Heart and Vascular Health explains the difference. An irregular heart beat can be alarming — while it happens from time-to-time, it may signal a more serious health issue. We asked Dr. Anu Agarwal of Renown Institute for Heart and Vascular Health which signs and symptoms should be addressed quickly. What exactly is an irregular heart beat? I get this question a lot. Basically, an irregular heartbeat, or heart palpitations, are an awareness of the heart beating and can be described as a “racing heart” or a heart skipping beats. A person of any age can experience heart palpitations. Are heart palpitations a serious health concern? That depends: While most heart palpitations are not harmful, they can be serious. The heart isn’t an organ to ignore, and since palpitations can range from harmless to possibly life-threatening, you should see a doctor for a correct diagnosis. Major red flags include coming close to or actually passing out, chest pain or shortness of breath. Causes can range from the common cold or other illness to underlying heart disease or a hormonal imbalance. At the most critical level, heart palpitations can warn of cardiac arrest and sudden death. Palpitations also can stem from atrial fibrillation, or AFib, the most common type of arrhythmia. This condition causes the heart to beat irregularly and often very fast, causing symptoms such as chest pain — ultimately leading to increased risk of stroke and heart failure. Can heart palpitations be avoided? Some risks factors, such as hereditary ones, are unavoidable, but other factors are controllable. Those include stress, sleep deprivation and alcohol consumption. Certain foods and even exercise have also been shown to trigger palpitations. How are heart palpitation treated? The treatment depends on the diagnosis. We ask patients to keep a diary of symptoms to help determine potential triggers, and if they can be avoided, no treatment is needed. If a patient is diagnosed with atrial fibrillation or flutter, blood thinners usually are recommended. Prescription medications are used to treat AFib, and some procedures can help, such as ablation, a radiofrequency treatment that helps restore a regular heartbeat. This treatment eases symptoms but doesn’t improve longevity, so it’s important to assure side effects are not worse than the symptoms. Of course, the usual healthy lifestyle recommendations apply: Maintain a healthy weight and avoid smoking, excessive alcohol and recreational drug use. The most important thing to remember is because heart palpitations could potentially be serious, anyone experiencing them should be evaluated by their doctor.